Microsoft and ESPN have signed an exclusive deal to bring your favorite sports to Xbox Live, and only Xbox Live. Do you like sports? Do you like sports on your Xbox 360? No longer will sports fans with Xbox Live be limited to the latest Madden titles: ESPN and Xbox Live have signed a deal that will bring 3,500 different live sporting events to the 360 in year one alone. The new feature will let Xbox Live Gold members watch literally thousands of sporting events on demand. The presenters demoed last years' USC vs. Ohio State college football game, and were able to pick what team they were rooting for, as well as instantly replay any of the game's major plays - just by saying "Xbox, replay!" There will also be trivia and other interactive elements. Best of all, if you have a Gold membership, all of the ESPN elements are absolutely free. Great news for sports fans with Xbox Live - at least here in the States, anyway. Hopefully our friends in Europe and the rest of the world will get something like that soon, so they can watch Robert Green's horrific choke-up in the England vs. USA match, over and over and over again. Stay tuned on our liveblog. 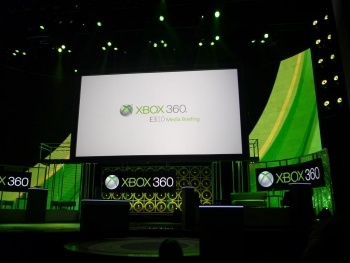 Keep track of our E3 2010 coverage here.